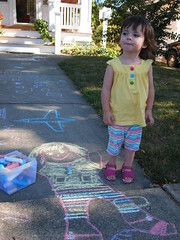 Sophie has turned the word “chalk” into a verb, as in “I want to chalk outside, mommy.” She loves it. She especially loves to trace things—her hands, her feet. While Andy’s traced her shadow, one afternoon I traced her and then tried to replicate her outfit. She wasn’t all that impressed. This entry was written by kara, posted on September 19, 2010 at 10:19 pm, filed under Uncategorized and tagged art, sidewalk chalk, Sophie. Bookmark the permalink. Follow any comments here with the RSS feed for this post. Post a comment or leave a trackback: Trackback URL.